First thing’s first- we would like to include a quick update on two of the stocks to appear in our report yesterday, in which we had already witnessed very nice gains. Both stock pressed to new highs during yesterday’s session, so we wanted to update readers on their continued success. Tandem Diabetes Corp. TNDM - We called TNDM initially on April 11th, whereupon we observed a low of 6.62. Yesterday the stock rose another 12% intraday, running from 10.75 to 12.05. That new high represents an 82% jump since our first alert, just over a month ago. To come back to yet another great call we made last Tuesday (05/08), we’ve got RKDA. A couple of sessions following that first call, the stock would register a low of 7.31, and this week, we’re seeing the stock reaching new heights. Yesterday it hit 12.25, which marks a rise of 67% in a matter of just six trading days. 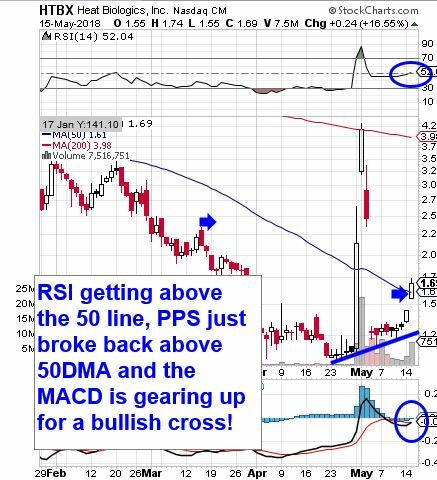 There is still a lot of room to the upside on the chart for RKDA to travel, so we’re definitely going to keep our eyes peeled for further bullish activity from RKDA. Speaking of charts with potential, we tagged HTBX on Monday, and it has been trending in the right direction, trading up from 1.35 to 1.74 so far. As you can see on the provided snapshot, it still has a very ripe-looking chart. 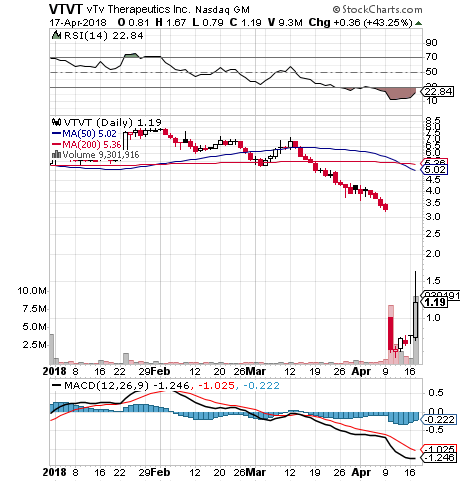 Our report yesterday morning included a look at the VTVT chart, and establishing our interest in tracking it as a bottom play. Our timing in this really could not have been any better as the stock not only made it biggest single session move of the year, but also traded its highest volume. VTVT ran from a low of .79 and reached as high as 1.67, a 53% intraday rip, and ended up closing at 1.19, filling a portion of the large gap which you can plainly see below. Based on the activity we’ve now witnessed, and the still-ripe look of the chart, we’re going to continue to keep a close watch over VTVT. We also want to begin tracking a pair of options contracts in the GDX chain. Gold has been doing well and looks as if another solid day could be in the cards. On that event, there should be some nice activity in the GDX Weekly $22.50 & $23 Calls, so we’ll be monitoring for that. It was a week ago today that we were commenting on our coverage of TNDM in 2018. We caught this stock at a low of 2.14 earlier this year, and it has come a long way since then. This week the stock has traded up to a high of 7.75, marking an increase of 262% since we began tracking it.